The Crown of Stephen Bocskai is a crown given by the Ottoman sultan to Stephen Bocskai, Prince of Hungary and Transylvania, in the early 17th century. It was produced from gold, rubies, spinels, emeralds, turquoises, pearls and silk (height 0,235 m, weight 1,88 kg). To save the independence of Transylvania, Bocskay assisted the Turks. In 1605, as a reward for his part in driving Basta out of Transylvania, the Hungarian Diet assembled at Medgyes/Mediasch (Mediaş) elected him Prince of Transylvania; in response the Ottoman sultan Ahmed I sent a special envoy to greet Bocskay and presented him with a splendid jewelled crown made in Persia. Bocskay refused the royal dignity, but made skillful use of the Turkish alliance. The crown is today displayed in the Kaiserliche Schatzkammer (Imperial Treasury) at the Hofburg in Vienna. Sigismund Báthory was Prince of Transylvania several times between 1586 and 1602, and Duke of Racibórz and Opole in Silesia in 1598. His father, Christopher Báthory, ruled Transylvania as voivode of the absent prince, Stephen Báthory. Sigismund was still a child when the Diet of Transylvania elected him voivode at his dying father's request in 1581. Initially, regency councils administered Transylvania on his behalf, but Stephen Báthory made János Ghyczy the sole regent in 1585. 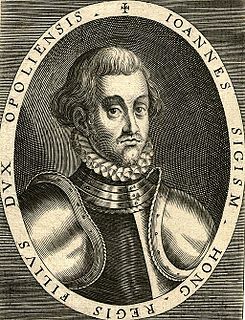 Sigismund adopted the title of prince after Stephen Báthory died. Gabriel Bethlen was Prince of Transylvania from 1613 to 1629 and Duke of Opole from 1622 to 1625. He was also King-elect of Hungary from 1620 to 1621, but he never took control of the whole kingdom. Bethlen, supported by the Ottomans, led his Calvinist principality against the Habsburgs and their Catholic allies. 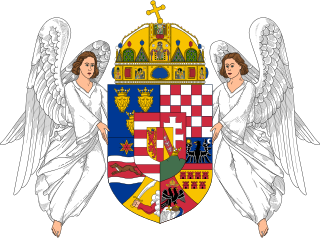 The King of Hungary was the ruling head of state of the Kingdom of Hungary from 1000 to 1918. The style of title "Apostolic King of Hungary" was endorsed by Pope Clement XIII in 1758 and used afterwards by all Monarchs of Hungary. John Sigismund Zápolya or Szapolyai was King of Hungary as John II from 1540 to 1551 and from 1556 to 1570, and the first Prince of Transylvania, from 1570 to his death. He was the only son of John I, King of Hungary, and Isabella of Poland. John I ruled parts of the Kingdom of Hungary, with the support of the Ottoman Sultan Suleiman; the remaining areas were ruled by Ferdinand I, who also claimed Hungary. The two kings concluded a peace treaty in 1538 acknowledging Ferdinand's right to reunite Hungary after John I's death, but shortly after John Sigismund's birth, and on his deathbed, John I bequeathed his realm to his son. The late king's staunchest supporters elected the infant John Sigismund king, but he was not crowned with the Holy Crown of Hungary. Gabriel Báthory was Prince of Transylvania from 1608 to 1613. He was the nephew of Andrew Báthory, who was prince of Transylvania in 1599. After his father died in 1601, the wealthy Stephen Báthory became his guardian and converted him from Catholicism to Calvinism. He sent Gabriel to the court of Stephen Bocskai in Kassa in Royal Hungary in early 1605. Gabriel inherited Stephen's estates, which made him one of the wealthiest noblemen in Bocskai's realm. Bocskai allegedly regarded Gabriel as his successor, but Bálint Drugeth was named as his heir in his December 1606 will. Stephen Bocskai or Bocskay was Prince of Transylvania and Hungary from 1605 to 1606. He was born to a Hungarian noble family. His father's estates were located in the eastern regions of the medieval Kingdom of Hungary, which developed into the Principality of Transylvania in the 1570s. He spent his youth in the court of the Holy Roman Emperor, Maximilian, who was also the ruler of Royal Hungary. Sigismund Rákóczi was Prince of Transylvania from 1607 to 1608. He was the son of János Rákóczi, a lesser nobleman with estates in Upper Hungary. Sigismund began a military career as the sword-bearer of the wealthy Gábor Perényi in Sárospatak. After Perényi died in 1567, Sigismund served in the royal fortresses of Eger and Szendrő. The royal chamber mortgaged him several estates to compensate him for unpaid salaries. He received Szerencs in 1580, which enabled him to engage in the lucrative Tokaji wine trade. He took possession of the large estates of András Mágóchy's minor sons as their guardian, and the second husband of their mother Judit Alaghy, in 1587. The Principality of Transylvania was a semi-independent state, ruled primarily by Hungarian princes. Its territory, in addition to the traditional Transylvanian lands, also included eastern regions of Hungary, called Partium. The establishment of the principality was connected with Treaty of Speyer. However Stephen Báthory's status as king of Poland also helped to phase in the name Principality of Transylvania. It was usually under the suzerainty of the Ottoman Empire; however, the principality often had dual vassalage in the 16th and 17th centuries. George I Rákóczi was Prince of Transylvania from 1630 until his death in 1648. The Eastern Hungarian Kingdom is a modern term used by historians to designate the realm of John Zápolya and his son John Sigismund Zápolya, who contested the claims of the House of Habsburg to rule the Kingdom of Hungary from 1526 to 1570. The Zápolyas ruled over an eastern part of Hungary, while the Habsburg kings ruled the west. The Habsburgs tried several times to unite all Hungary under their rule, but the Ottoman Empire prevented this by supporting the Eastern Hungarian Kingdom. Andrew Báthory was the Cardinal-deacon of Sant'Adriano al Foro from 1584 to 1599, Prince-Bishop of Warmia from 1589 to 1599, and Prince of Transylvania in 1599. His father was a brother of Stephen Báthory, who ruled the Polish–Lithuanian Commonwealth from 1575. He was the childless Stephen Báthory's favorite nephew. He went to Poland at his uncle's invitation in 1578 and studied at the Jesuit college in Pułtusk. He became canon in the Chapter of the Roman Catholic Diocese of Warmia in 1581, and provost of the Monastery of Miechów in 1583. The Bocskai uprising was a great revolt in Hungary, Transylvania and modern Slovakia, between 1604 and 1606 against Rudolf II, Holy Roman Emperor, during the Long Turkish War. The leader of the rebels was István Bocskai, a significant Protestant Hungarian nobleman. The great Ottoman war burdened the Hungarian Kingdom and led to famine and epidemics. The armies of the Christian states also destroyed as the Ottoman and Tatar forces.